Duff Bevill of Bevill Vineyard Management. 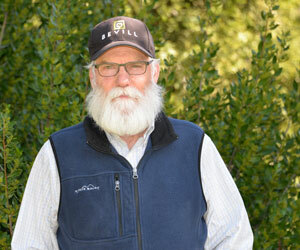 Duff Bevill, founder of Bevill Vineyard Management (BVM), moved to Sonoma County in 1973. He grew up in Southern California, right outside the Los Angeles city line in a newly developed suburb that had previously been prime farmland. Bevill’s father worked in the aerospace industry and his mother was a school teacher. Bevill recalls always being intrigued by farming and having a relationship with the farmer who had sold the Southern California land for development. After moving to Sonoma County, Bevill began working for Joe Vogensen in his vineyard. A few years later, he started working for the Wolcotts. Eventually, in 1979, he moved from being an employee of Dry Creek Vineyards to an independent contractor. Through the early 80’s, BVM was a one person company. Bevill and his wife, Nancy, bought their first property in 1983, also the year Bevill hired his first employee. Today, BVM has 65 full time employees and more than 100 during harvest. Bevill owns, leases and manages more than 1,000 acres. His clients range from locals living in town to clients in Louisiana who own land in Sonoma County. BVM is continually exploring new technologies to keep the company up to date and contemporary. The company embraces continued education for their employees and encourages them to be innovative, said Bevill. Bevill was involved with the winegrape commission’s decision to become 100% sustainable by 2019. Bevill has always been actively involved with agricultural organizations throughout Sonoma County. 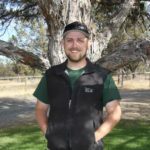 He was a board member for the Sonoma County Grape Growers from 2000-2006, holding the President’s office in 2004-2005. During this time, he was involved in founding the Sonoma County Winegrape Commission. Bevill has been a director of the commission since 2006 and served as Chairman from 2006-2008. 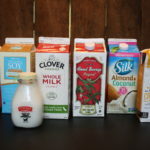 Bevill has also been a Sonoma County Farm Bureau member since 1976. He recalls memberships being $35 when he first joined, and emphasized Farm Bureau is still a beneficial organization for the county. BVM renewed their membership this year, upgrading to the Premium level. Bevill said Premium Membership is a good demonstration of supporting all agriculture throughout the county. Additionally, he also sees Premium Membership as good exposure to the community. Bevill said farmers are always fighting the fight against people who don’t like agriculture, and there’s more pressure than ever to be good land stewards. At BVM, their goal is to be the best stewards they can be so land is passed on to the next generation in the same condition, if not better.